Yippee! BlogRolling seems to be working again, which is pretty much evident from the little stars in the my blog roll. But for how long, only Blogrolling can tell. I rely heavily on this particular tracker to keep track of new posts in my favorite blogs and when it stopped working, I almost lost touch with the my foodie friends. Even though Google Reader provides a similar facility, I always missed BlogRolling and the ease of use it came with. Now I am really really happy! Lychee or Litchi – The fruit with a prickly rough skin and luscious pearly pulp. The aroma of the pulp reminds me of roses or rose essence to be precise. 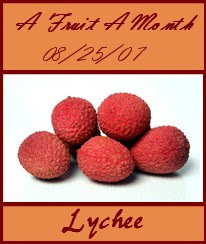 And thanks to Sig, the host of AFAM, I tried my hand on Litchis this month. I didn’t have the heart to juice or puree these beauties which stood with the toughest of tenacity. So I simply blended them in a creamy tapioca pudding. Peel and cut the litchies into halves. 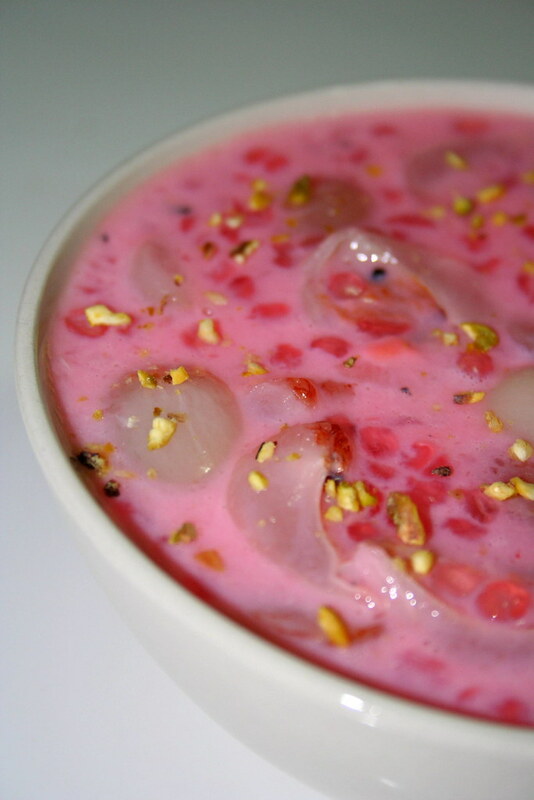 Soak Sago in about a cup of water for 20 mins. Mix milk with water and bring to a boil. Add sugar and cardamom. Drain the water from the sagos and add next. Simmer on a low heat till sago is cooked. Sago/Tapioca pearls are cooked when they turn transparent. Add food coloring if desired and stir till well blended. Next stir in the litchies and the vanilla extract and cook for 10 more minutes. Garnish with nuts. Sig very graciously agreed to accept my entry, when I asked her if I can send it in late. Thank you Sig! And armed with this pudding, I celebrate the two awards which have come to my keeping – the Rocking Girl blogger award from Kribha of En Veetu Samayal and Madhavi of MyVeggieWorld and the Schmooze award from Mallugirl of Malabar Spices. Coffee of The Spice Cafe. Check out how to peel a litchi here. Check out what Tapioca is made from here. Terror strikes our India again in the form of twin blasts at Hyderabad, the quaint old city. Among the myriad of emotions coursing through my mind at the moment, the one which is all consuming is the awareness that terrorism can strike so close. At this most distressing moment, my heart goes out to the innocent lives and I pray for the strength of their kith and kin. 1. My family stopped lighting fireworks ever since I was 13. My dad pointed out the hazards created by the debris and noise of fireworks and we kids agreed. The first year was hard but the feeling of satisfaction was immense. On Diwali while all other houses are adding their share to the garbage and noise pollution, we light lamps all over the house and turn off the electric ones. 2. I have stopped using incandescent light bulbs and have switched over to compact flourescent ones. 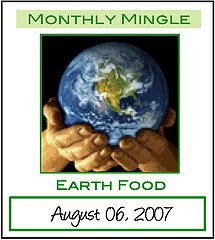 And what better way to celebrate MM – Earth Food than with organic fresh produce? 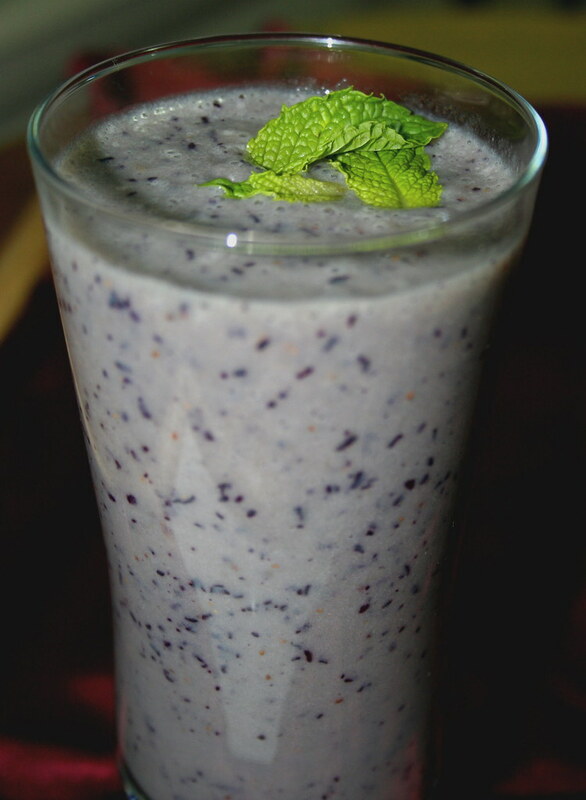 Using the organic blueberries which we picked from a farm a month ago, I made a milk shake. The original recipe is from the web, though I don’t remember the source and I modified it to suit my taste. Blend everything till smooth. Adjust the honey according to your taste or replace it with sugar. A very ripe banana makes this drink very flavorful. This is a very simple recipe and I am not sure if Meeta would accept my entry. But nevertheless I am sending it across. Its JFI time again and lovely Nandita has chosen the red carpet for Chillies. May be because Chillies are an integral part of Indian cooking, I found it very difficult to choose any particular recipe. After much wavering I settled on Jalapenos and an appetiser I had been wanting to post for long. As usual I modified the recipe to suit my palate and it turned out great. Deseed Jalapenos and grind to a fine paste without water. Heat a little oil in a small saucepan and add the ground jalapeno. Fry till moisture evaporates and the jalapeno is cooked. Add a little salt in the process. Meanwhile cut the eggs lengthwise, scoop out the egg yolks and keep separately. Arrange the egg whites on a plate. 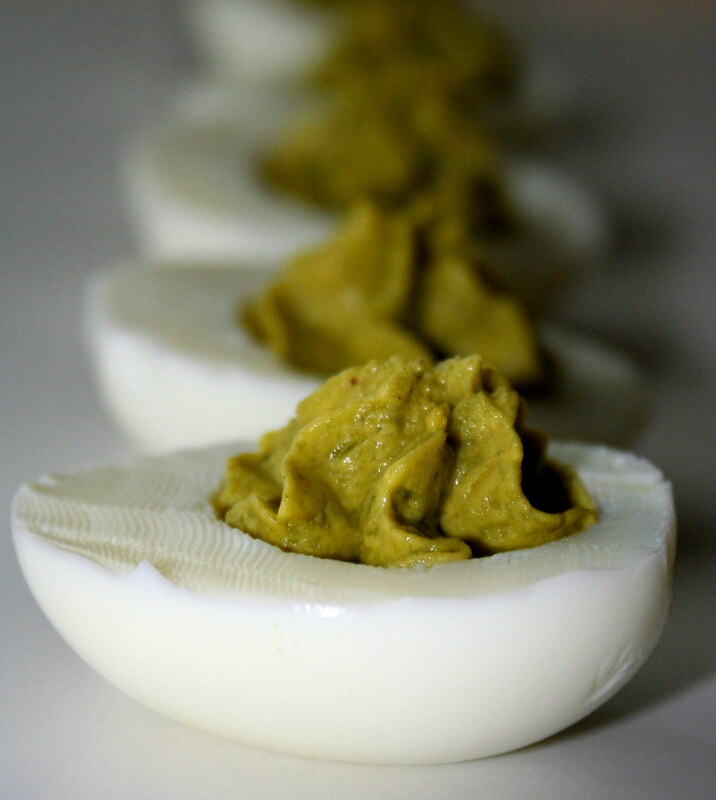 Mix the jalapenos with the egg yolks and mash till well blended. Next add the rest of the ingredients and mix well. Stuff the mixture back into the egg white halves. Sprinkle with minced coriander and serve. You can vary the seasonings, adjust the number of jalapenos or can even substitute it with other chillies or black pepper. It’s totally up to you.